Oh my....home sick today, but feeling better. Cruising the web and finding the most creative and yummy ideas to try. Are these not the cutest? 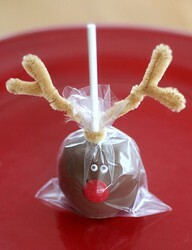 I really want to try making cake pops. They seem pretty easy but the directions vary depending where you look. I guess you just try them until you find one that works. I will definitely be doing some baking soon. YUM!! 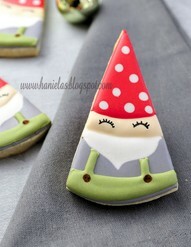 And look at these adorable sleeping Santa cookies... what kiddo wouldn't want one of these? 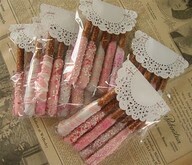 And one more.... chocolate covered pretzels, but look how nice it looks with the doily on the top of the bag. So simple but pretty as a gift to give. So crafty! !